Vegetables are our staple ingredient as delicious and healthy. Emily was inspired by Jamie Oliver’s recipe for vegetable chilli so with a few minor adaptations I cooked up a hot chilli dinner! 2 medium sweet potatoes – peeled, cut into chunks, drizzled with olive oil, with a pinch of cayenne, cumin and cinnamon and roasted at 200C for 40 mins. Set aside. Heat a large pan over a medium heat, add olive oil. Add onion, peppers squeeze garlic paste and squeeze chilli paste to your taste and cook for 5 mins. Add to the large pan one teaspoon of Cayenne, one teaspoon cumin, one teaspoon cinnamon and the finely chopped coriander stalks. Cook for a further 5-10 mins. Drain 1 tin of chickpeas and 1 tin of kidney beans. Tip them into the onion and pepper mix with 2 x 400g tins of chopped tomatoes. Stir well and simmer to thicken and reduce. Finally bring it all together – stir the roasted sweet potatoes through the bean mix and add all the fresh coriander leaves. Salt and pepper to taste. We ate ours with guacamole, sour cream and tortilla chips. 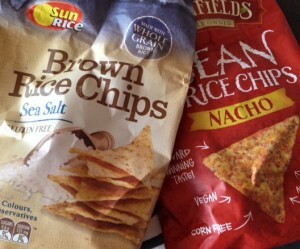 There are some healthier nacho and whole grain rice chip options in the gluten-free aisle of the supermarket. Yum! This entry was posted in SCI Diet and tagged Carers blog, Diet, food and nutrition, Healthy choices, Jamie Oliver, lifestyle Choices, Nutrition, people with disabilities, Recipes, sweet potatoes by everydaycarer. Bookmark the permalink. Thanks Rachel! I’m loving your recent recipe posts – all have been coincidentally vegan so v useful chez moi!